SANTA FE – Nine years ago, the veteran antiques and ethnographic show production team of Kim Martindale and John Morris launched an experiment in Santa Fe. In a single show they would blend antiques, fine art, contemporary design and fashion, emulating the way musical crossover and culinary fusion bring together the most complementary aspects of diverse modalities. They called the show “Objects of Art,” and in its early presentations their experiment struggled to attract exhibitors courageous enough to show important works in a nontraditional setting and searched for an audience receptive to the novelty of integrating distinct artistic mediums and the often conflicted intentions of collecting, decorating and styling. In its early years, the show remained in quest of a clear mission, to a large degree because it included the dominant presence of American Indian art. Then, in 2012, Martindale and Morris launched their Antique American Indian Art Show and cleared the way for Objects of Art Santa Fe to achieve its original goal. When this year’s show opened on August 9, it was imminently clear that Martindale and Morris’s persistence in nurturing and adjusting their venture for nearly a decade was well worth the risk. "The Palominos" by Maynard Dixon, 1941, gouache on paper. Objects of Art’s earliest visitors were welcomed not just with New Mexican champagne and delicacies from Santa Fe’s new restaurant, Sazon, but with a stunning illustration of the show’s now successful underlying intention. The preview reception took place amidst sculptural groupings of furniture by the luminary of the American craft movement, George Nakashima, and his daughter, Mira, complemented on the walls by captivatingly harmonious Western paintings and drawings from the show’s second major exhibit, “Maynard Dixon’s New Mexico Centennial.” The exhibition included more than 100 Dixon paintings, drawings and documents curated by Dixon expert, Mark Sublette, celebrating the centennial of Dixon’s first New Mexico show at the Museum of Fine Art in September of 1918. 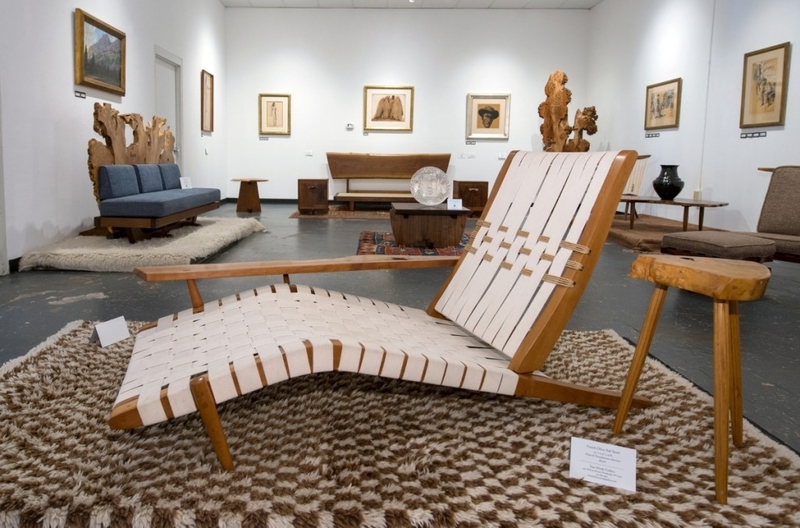 The Nakashima exhibit featured more than 40 naturalistic sculptures in furniture curated by Mira Nakashima from her own personal collection and those of Hunt Modern, Santa Fe, and Four Winds Gallery, Pittsburgh, Penn. ; combined with the often-ethereal Dixon portrayals of New Mexico landscapes and life to offer a clear articulation of the mission of Objects of Art. Taking place in the heart of the Western art world at the beginning of Santa Fe’s brief native arts season, it is inevitable that Objects of Art has an ethnographic bent, but even with that backdrop, the show’s exhibitors and artistry range far beyond the American Southwest. Arnold Lieberman, long a New York City dealer who now spends part of the year in Santa Fe, specializes in Hindu and Buddhist arts from ancient Afghanistan to imperial China, but central to his booth was a large Nineteenth Century entomological teaching model. Paul Haig, of Haig’s of Rochester, one of Michigan’s largest jewelry stores, is also an avid collector, and now dealer of Asian lacquers, textiles, bronzes, prints and ceramics. A major player in Southwestern objects, Jeff Hengesbaugh selected objects familiar in form but transcendent in unique quality, most notably katsina-like sculptures of a shaman and a priest. Jean Compton, a folk art dealer from Texas, took her cue from the Chinese Year of the Dog, featuring sculpted, painted, carved and toy stuffed dogs with cameo appearances of her own standard poodles. Spanish Colonial works in silver dominated the venerable Economos Works of Art/Hampton Gallery of Santa Fe’s Canyon Road, while John Ruddy and Kumi Masumoto of John Ruddy Textile Art, also of Santa Fe, showed a variety of Japanese traditional, formal and folk textiles in a booth of perfect balance. Atlanta-based tapestry artist Jon Eric Riis, whose work is held by the Art Institute of Chicago, the Museum of Arts and Design in New York and the Renwick Gallery of the Smithsonian American Museum of Art, showed both his own creations in silk and metal threads and a mid-Twentieth Century shaman’s coat of porcupine quills from the Cameroons, West Africa. Danielle Foster-Herbst of Atelier Danielle creates unique custom clothing for both men and women from unusual and historically significant textiles. Her booth offered a selection of contemporary attire far removed from the Native American antiques and textiles specialized in by her equally well-known husband Toby. From Hong Kong, Plum Blossoms Gallery displayed statuary, furniture and textiles from China and Japan, while Taylor A. Dale showed several important, but seldom seen, African works from his own collection. After decades of gallery operations in Santa Fe and abroad, Tad and Sandy Dale are now showing solely by appointment and at select shows. Robert L. Parsons, who with his daughter, Ashley, now operates two major galleries in Taos, N.M., sold paintings by Dorothy Brett and Logan Maxwell Hagege during the show, and their booth included major works by Fremont Ellis and E.L. Blumenschein. Pascoe Gallery of Miami, Fla., appearing for the first time, brought a selection of Ardmore Ceramic Art, featuring exotic contemporary renderings of regional wildlife in the bold patterns and colors of the South African wilderness, while Robert Sommers’ Blue Heron Gallery blended engaging early Southwestern objects, including a Seventeenth Century leather ecclesiastical box with more traditional but still exceptional works in silver, crystal and ceramics. To this gathering of significant works and substantial exhibitors, Objects of Art added a series of worthwhile and well-attended lectures in the El Museo little theatre, which included “Nakashima Then and Now,” a deeply personal reflection by Mira Nakashima, and Mark Sublette’s scholarly and entertaining talk on Maynard Dixon’s New Mexican Centennial. The Objects of Art Santa Fe Show, which previewed to 500 guests at a champagne reception benefitting Assistance Dogs of the West and a preview party supporting KNME New Mexico Public Television, experienced a 12 percent increase in attendance over last year’s edition, according to the producers. For additional information, www.objectsofartsantafe.com or 310-822-9145.